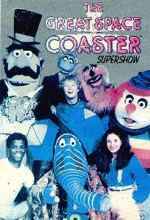 The Great Space Coaster was the anti-Mister Rogers Neighborhood, a land of sassy insults, practical jokes, and plenty of shouting. And it was the funniest thing many a grade school tyke had ever seen. Humans Francine ("Fran" to her friends), Roy, and Danny mingled with puppets big and small to teach kids lessons about life and the joy of discovery. Among the non-human cast were excitable Goriddle Gorilla, clown-looking Baxter, Edison Elephant, prissy and daffy bird Knock-Knock, and the mean M.T. Promises. The Huggles ("Hey, what's snappening?") joined the cast later in the show's run, but the real star was a green, hairy fellow named Gary Gnu (accent on the "G"). Gary wasn't any cuter or cuddlier than his fellow puppets, but he got to host the show's news segment, giving birth to the unforgettable catchphrase, "NO g-news is GOOD g-news, with Gary...Gaaa-nu." The show's format featured stories, songs (many performed as music videos by the human stars), skits, and short films viewed on Roy's hand-held magic screen. Another regular feature was Speed Reader, who, according to his theme song, could do a handstand and read everything on the newsstand. Occasionally, celebrities like Sugar Ray Leonard and Sally Struthers stopped by to visit. The show only ran for five years, from 1981-86, but it left a strong impression on those who watched it, many of whom still can't (or won't) pronounce the word "gnu" correctly. On the Great Space Coaster, off we go..."